Prefrozen meals can be lifesavers no matter the size of your family. While you may think twice about purchasing frozen meals that are easy to prepare at home, meals that require multiple ingredients or take more than a few minutes of your time to prepare, such as lasagna, may become dishes you enjoy either less frequently or not at all. To persuade you to put lasagna back on your dinner menu, the Stouffer company makes available numerous varieties of frozen lasagna you can cook in your conventional oven and, for smaller serving sizes, your microwave oven. Inspect the box your lasagna comes in to see if it has a thawing option. If it does, you can remove the lasagna from your freezer and thaw it in your refrigerator for up to 48 hours before cooking. This option is available as a way to speed up the cooking times of larger serving size varieties of Stouffer's lasagna. Preheat your oven to between 350 and 400 degrees Fahrenheit, depending on the amount you are cooking. For example, preheat your oven to 350 degrees Fahrenheit for a two-serving 10.5 oz. package and 400 degrees for a family-size, 96 oz. package. Remove the lasagna from the box it comes in and set it onto a baking sheet. Uncover the lasagna by removing the plastic film from smaller serving sizes and the aluminum lid from larger sizes. Make a slight crease in the middle of the aluminum lid and set it onto the large pan of lasagna, forming a tent over the pan. Set the baking sheet and lasagna in your oven. Bake smaller sizes for about 48 minutes, thawed larger sizes for about 50 to 60 minutes, and frozen larger sizes about 1 hour and 40 minutes, removing the shielding tent during the last 15 to 20 minutes of cooking. 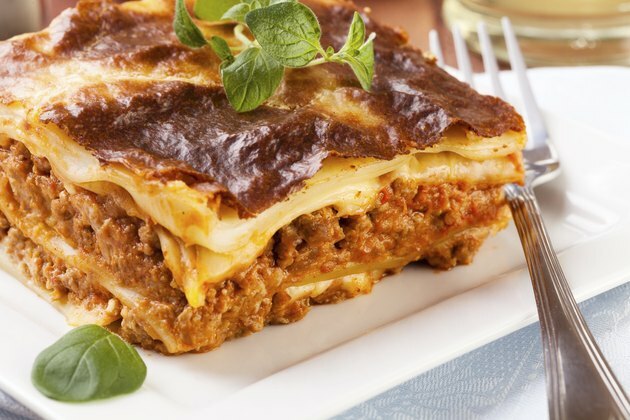 Insert a meat thermometer into the center of the lasagna to ensure that the internal temperature of any size lasagna is at least 160 degrees Fahrenheit before removing the baking sheet from your oven. Remove the lasagna from your oven. Allow smaller sizes to sit on the baking sheet for five minutes and larger sizes to sit for 15 to 20 minutes before cutting and serving them. Inspect the box your lasagna comes in to see if it has a microwave cooking option. This option is available as a way to speed up the cooking time of smaller serving size varieties of Stouffer's lasagna. Remove the lasagna from the box it comes in and make one or two cuts into the plastic film to allow steam to escape as the lasagna cooks. Cook the lasagna on "HIGH" for four minutes, then remove the plastic film so that the lasagna finishes cooking uncovered. Set your microwave to medium or 50 percent and continue cooking for another four minutes. Insert a meat thermometer into the center of the lasagna and ensure that the internal temperature is at least 160 degrees. Set your microwave timer for five minutes and allow the lasagna to rest in your microwave during this time. Remove the lasagna from your microwave and serve. If you thaw a Stouffer’s lasagna in your refrigerator, you cannot refreeze your meal and must cook it within 48 hours.